That are dreamt of in your philosophy"
Manufacturers of videocards and MPEG-2/MPEG-4 decoders made it possible and even habitual to connect a computer to a TV and even triggered the appearance of HTPC (Home Theatre Personal Computer). However, HTPC is a topic for another discussion, beyond the scope of our review. Meanwhile, the developing speed of the so-called HomeLan's (computer networks connecting flats and even heighbourhoods) is really astounding. And naturally, music and films have a significant place in all the information available to network users, and their collections can be quite copious. 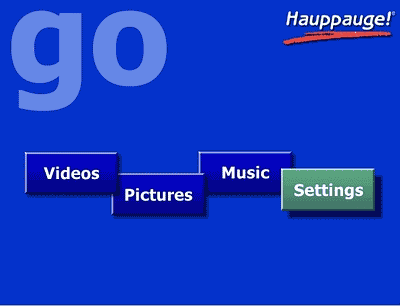 So Hauppauge Computer Works, Inc. thought, 'Why not exclude a redundant link from the network-PC-TV chain?' 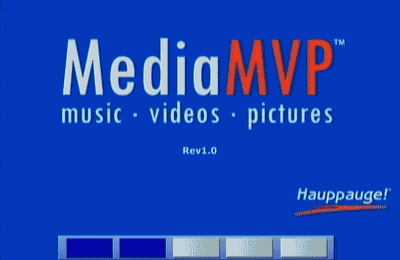 and presented Hauppauge MediaMVP, "the coolest video product on the Planet! ", according to the company's site. 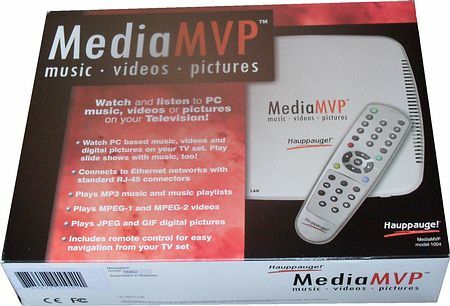 MVP stands for Music, Video, Pictures and implies the possibility to connect the device via a standard RJ-45 cable to a hub (switch, or router) or directly to a network card thus enabling to reproduce videos on the TV screen and play music on any device with an Audio-In. And besides the fact that the files can be in any of the network computers, there is no more need to place that noisy box with a monitor in your flat, as the twisted pair transmits signals at the distances up to 100 meters. Well now, let's put it all to the test. In my opinion, the box design is too bleak for "the coolerst device on the Planet" :-). 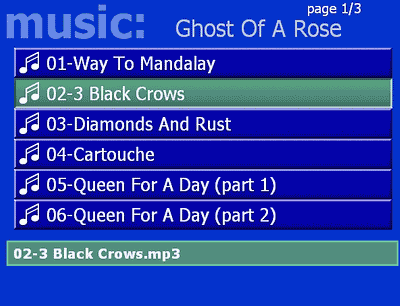 and then renaming the file into *.mpeg. But the absence of AC3 support (we'll come back to it later) requires a sound recoding and a reverse mixing, which creates more problems :-( . 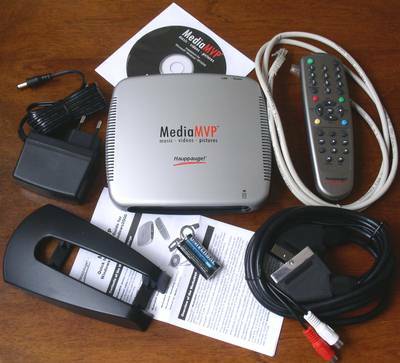 It wouldn't be out of place to mention that the manufacturer recommends to use MediaMVP with its own TV tuners to reproduce the files that have been received with its help (although any capture device can be used). Considering that some models have hardware compression in MPEG-1/MPEG-2, there is a certain logic in using the supported formats. 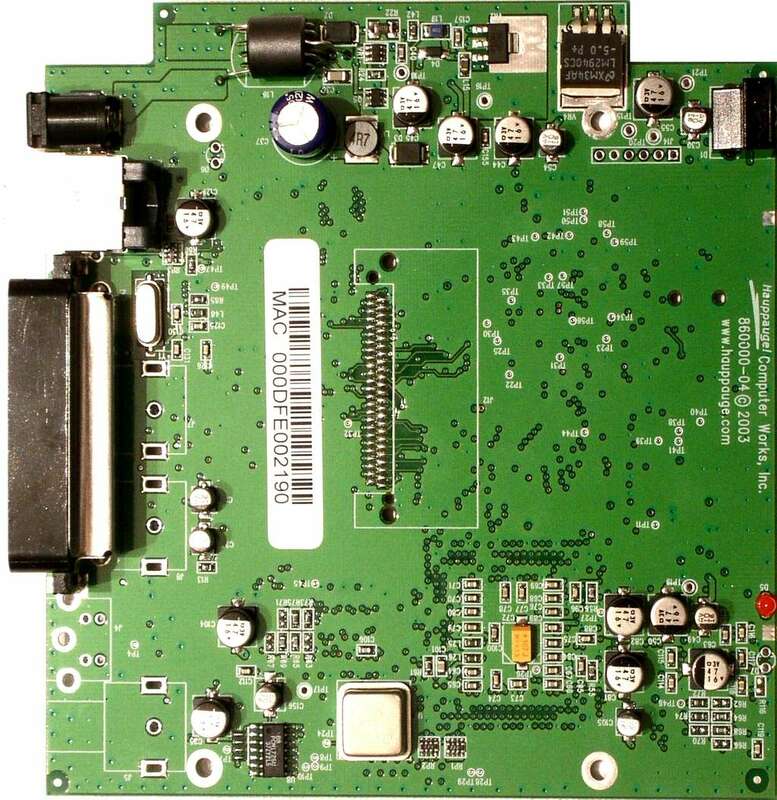 The front panel of MediaMVP, though seeming devoid of anything, contains an IR sensor of the remote controller. 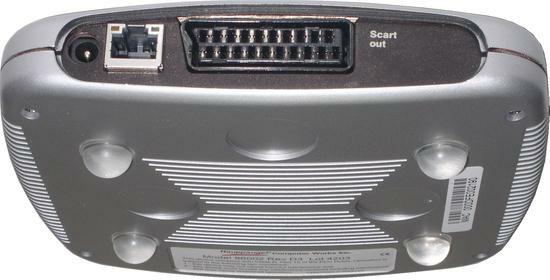 The back panel houses an Audio-Out, a Video-Out, an RJ-45 connector, and a power socket. The non-skid legs enable to place MediaMVP on almost any surface. And those who want the device to occupy less space can use a support that holds it in a vertical position. Now let's look at the insides. 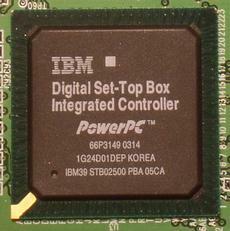 The heart of MediaMVP is a controller of the STBx25xx series, based on an IBM Corporation PowerPC 405 CPU. Curiously, the chipset enables to work with DVD, which makes us think that the absence of its support in MediaMVP is caused by the reservation of the author's rights. 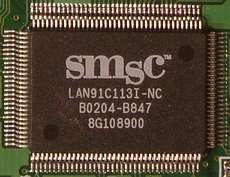 Network operations are possible due to a 10/100 Mbit/sec LAN91C113I-NC controller made by SMsC. 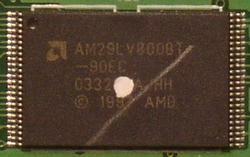 and a 8-Mbit flash-memory module by Advanced Micro Devices, containing a special Linux (!) version that actually drives MediaMVP. It will be recalled that the cross-over cable for a direct connection is not included in the package. 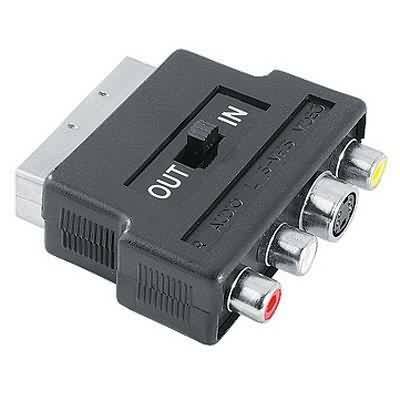 The variant we got had a SCART connector (as was mentioned above, models with an S-Video/Composite video/Stereo audio set of connectors do not support RGB), so the tests were carried out both with a SCART  SCART connection and with a necessary adapter. 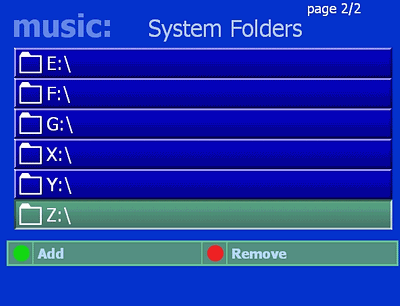 and a utility to add files and folders into the list. A bit unusual, I must say, but nothing doing. What is puzzling is that the device has no Switch-on button and starts working as soon as the power is supplied. Similarly, there's only one way to switch the device off. Unfortunately, we have no choice but to banally pull the plug out of the outlet. If you use a direct connection to the computer, the manual recommends to create a permanent IP address, although we had no problems using dynamic selection. If you have a Firewall installed, don't forget to allow access to the coresponding processes. We switch the device on, and the screen shows the loading process that lasts two or three minutes. However, different network configurations may require a longer time. Then the main menu appears. We will begin with Settings. 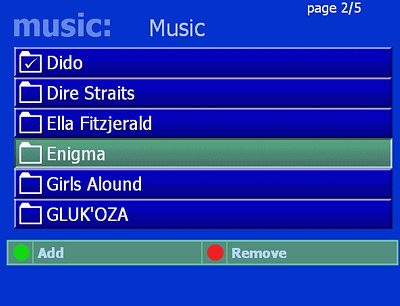 The Music, Video, and Pictures options are used to add the respective files into the list, like the mentioned search utility does. 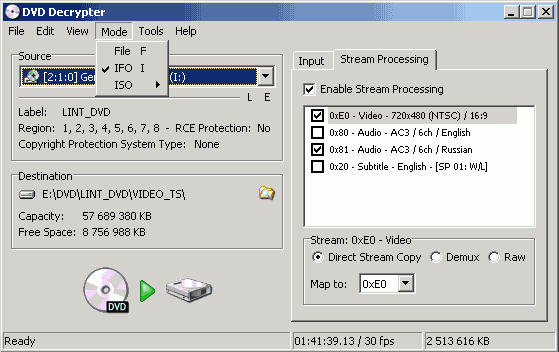 Here you should display real patience, as folder viewing can take a long time if you have a lot of video files. The Settings menu is laconic and requires no special comments (the only noteworthy things are the presence of the announced Flicker Control setting and 8 languages excluding Russian). Any parameter change always invokes a confirmation request. The selected S-Video option doesn't affect the loading and connecting processes and the colour only appears in the main menu. RGB connection is specified automatically when you try to change the Video Format option, although there's not a single word about it in the manual. 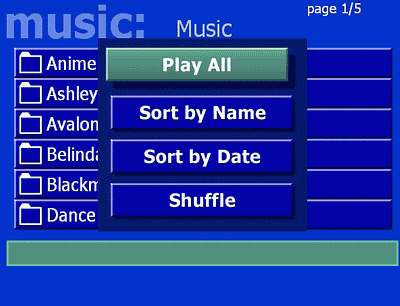 The list of music files supports sorting by name and date, play-all and shuffle modes. 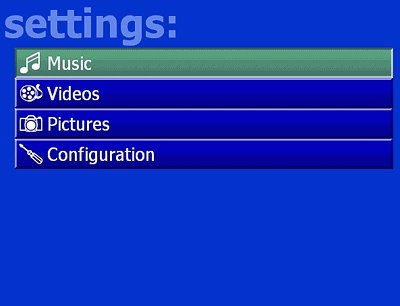 The Video menu is organised in a similar way. 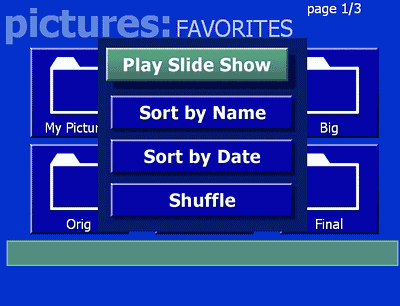 Pictures are organised similarly, except there's a Slide Show mode instead of Play All. You can also playback music while viewing the pictures. But unfortunately, the images can't be rotated. The video quality is at least not worse than the quality you get by displaying the video on a TV screen using modern videocards. 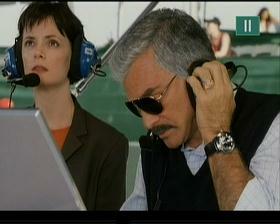 For capturing, we used an ECS EZ-TV (TVP3XP) TV tuner based on Philips SAA7134HL, with the S-Video input as the source. It's a pity that the sound can only be played in Stereo. AC3 support would be very appropriate here (according to the specs, it is available in PowerPC chips series STBx25xx). 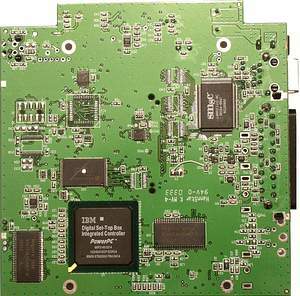 But then again, the manufacturer positions MediaMVP as a device working with the files that were received with the help of TV tuners and capture boards. And you don't come across a 5.1 sound too often in these conditions. No claims can be expressed about the output sound. We can only note a heating of the PSU and the device itself, and a couple of buzzings (probably, due to Linux :-) ), but they are all just minor shortcomings. 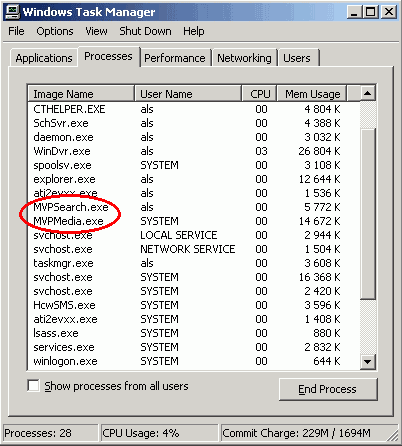 MediaMVP's main advantage is a minimal use of computer-server resources. When we loaded a test file at a 9 Mbit/sec bitrate, the CPU load was just 0-2 percent. 3DMark'2003 started in parallel showed no deviations from the norm. The remote controller is unified with the rest of Hauppauge production line, so don't be surprised, for example, at the Record button that doesn't work. However, Hauppauge engineers have taken a really creative approach, as the latest software version enables to use 0 to 9 digits for fast-forwarding the file. 1 fast-forwards the file by 10 percent of the length, 2 by 20 percent, etc. I wonder if other manufactureres will develop this original solution in their products. The Power button does not switch off MediaMVP but invokes a standby mode. This solution seems sensible considering the connection time, but full switching-off could be realised as well, like it was done in DVD2Go MPB680. Well, I would say summing up hasn't been so easy for quite a while. 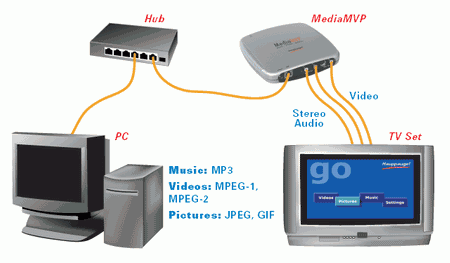 No support of DVD, DivX, wma, wav, etc. 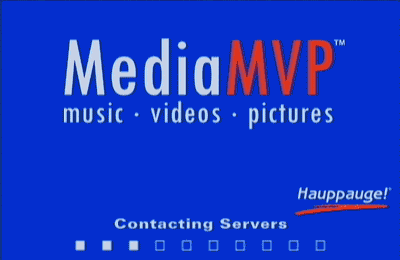 Hauppauge MediaMVP is literally a breath of fresh air for the market. 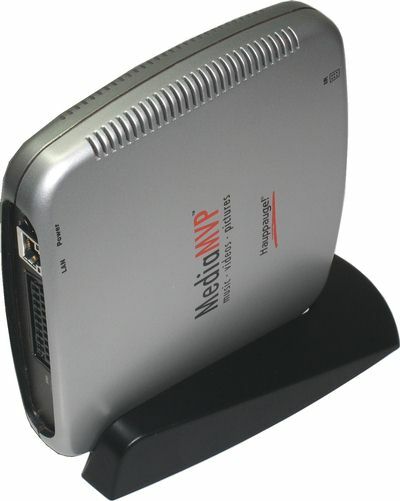 Its high quality, convenience in use, and low resource consumption make MediaMVP applicable in various spheres, from own media-network organisation to a helping role in presentations. 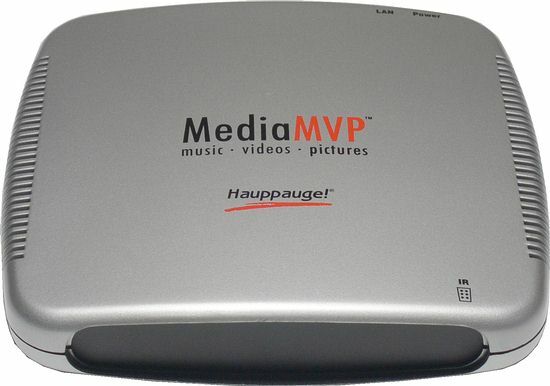 What is especially encouraging is that Hauppauge MediaMVP is sold at a quite moderate price despite the absence of rivals. Thus, the recommended retail price in Russia was $119 when the article was being written.